Who needs a different glass for various styles and varieties of wine when the "One for All" Gabriel-Glas is all that's needed for every wine. Such is the contention of the renowned Swiss wine critic René Gabriel, the creative genius behind the Austrian made Gabriel-Glas a perfectly shaped glass designed to highlight the bouquet of white, red, sparkling and dessert wine. 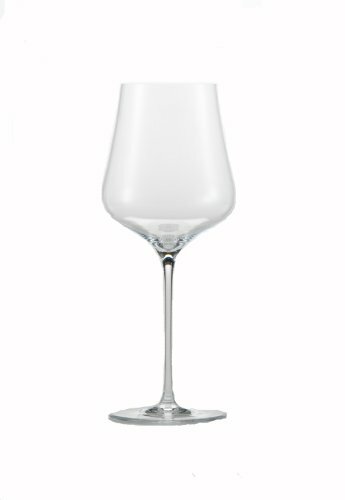 The Gabriel-Glas new to the American market is the ideal shape to complement any wine. The broader base of the bottom of the glass is a "bouquet-driver." The slightly conical design concentrates the aromas and pleasurably delivers them to the consumer and offers "unbelievable wine enjoyment." The Gabriel-Glas is elegant, sturdy and dishwasher safe. And it's a space-saver too. What's more important to the wine enthusiast a cupboard full of glasses in all sizes and shapes, or a good supply of the "One for All" Gabriel-Glas and cellar full of wine. Driven by a lifelong passion for wine, Austrian entrepreneur Siegfried Seidl and renowned wine critic René Gabriel have collaborated to create a glass of uncompromising quality, yet affordable, the Gabriel-Glass. The glass is made of the highest quality lead-free crystal, produced near Salzburg, Austria. This Gold Edition Two-Glass Gift Box contains 2 "lighter than air" mouth-blown Gabriel-Glas, fine Austrian crystal wine glasses. The amazing "One for All" wine glass a single glass suitable for every type of wine. If you have any questions about this product by Gabriel Glas, contact us by completing and submitting the form below. If you are looking for a specif part number, please include it with your message.